The sale of non-league Basingstoke Town on Ebay was "a misguided publicity stunt", according to the club. The Southern League Premier side were listed on the auction website on Tuesday with bids starting at 99p. Bidding was suspended by Ebay within the first five hours after reaching £65,900 when a number of high-value offers triggered its security settings. A new listing has been created, but Basingstoke say creator Simon Hood is "not in a position to sell the club". Hood, a former director and supporter, told BBC Sport he has had no contact from the club and intends to keep the listing going until bidding closes on 13 December. 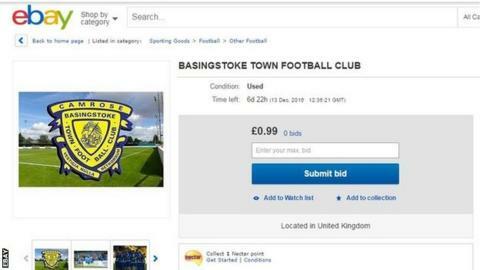 Basingstoke Town said the idea of using Ebay to attract new investment has never been discussed. However, the club statement applauded "the stunt" for drawing attention to their need to review the Hampshire side's structure with long-standing chairman Rafi Razzak set to step down in May. Basingstoke, nicknamed The Dragons and founded in 1896, face an uncertain future at their current Camrose Stadium and have debts of £2m. Planning permission for a new 5,000-capacity stadium and training facility on the edge of the town was refused in January. Mr Razzak was critical of the decision and admitted his "vision for the club had failed at the local council's hands".